In my house I think crafting is really just second nature. We have craft supplies all over the place pretty much all of the time. If it's not my daughter working on a project it's probably me...or possibly even both of us. We just both really enjoy making things for ourselves and for others. I've always taught her that it's better to give than receive and what better way to show you care by giving something made from the heart. I will however admit I'm not a naturally crafty person like she is. I'm the one that needs a picture to look at or a book to follow along with to come up with creative things. 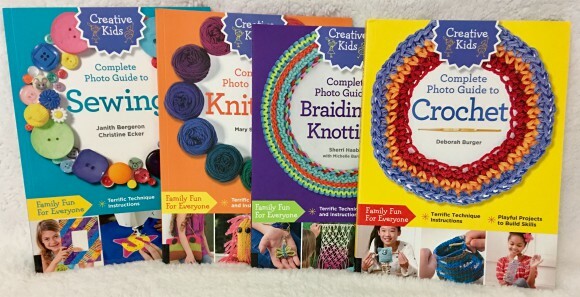 The books in the Creative Kids line are great for learning several different types of crafting skills. I love that they are easy to read and simple to follow. Each book starts out with the basics about the titled craft, and then it goes into step-by-step instructions that are easy to follow. Yes I know they are supposed to be for kids, but I think I was even more excited than my daughter to receive these books to check out. They teach you from the ground up so to speak making it easy to follow along. Unlike some adult crafting books that I've actually put down because they were just way over my head as a beginner. If you or someone you know wants to try out a particular craft these books are definitely the way to go! Creative Kids Complete Photo Guide to Sewing starts with the absolute basics about stitching, beginning with simple hand sewing, then gradually introduces skills and techniques until kids are sewing safely and confidently at a sewing machine. With over 200 photos and clear, concise instructions in language easily understood by grade-school kids, you're going to be creating crafty sewing projects with your child in no time! Each project lists the sewing skills that will be exercised in making it and projects are rated for difficulty, so kids can learn and grow as they develop dexterity and coordination. Your children will learn to sew by making simple projects and building skills by practicing the essentials, and this book provides a sound foundation for a lifetime of sewing enjoyment. Creative Kids Complete Photo Guide to Knitting starts with the absolute basics about knitting, beginning with a discussion about needles and yarn, how to cast stitches onto the needle, then gradually introduces skills and techniques until kids are knitting confidently. Mary Scott Huff, author of Fun and Fantastical Hats to Knit and Fun and Fantastical Slippers to Knit, will guide you and your children through projects. With over 200 photos and clear, concise instructions in language easily understood by grade-school kids, you're going to be creating crafty knit projects with your child in no time! Creative Kids Complete Photo Guide to Braiding and Knotting gives readers the basics for working with different cords and fibers to create projects such as bracelets, necklaces, leashes, keychains, wall hangings, and more. Some of these fun projects incorporate beads, stones, and other findings. Each section begins with an introduction to the materials required then gradually introduces skills and techniques until kids are braiding and knotting with confidence and ease. Visual learners will love the 250 how-to photos and illustrations, as well as clear, concise instructions--all easily understood by grade-school kids. Each project lists the skills that will be exercised in making it, and projects are rated for difficulty, so kids can progress to higher levels as they learn new skills and develop dexterity. Creative Kids Complete Photo Guide to Crochet starts with the absolute basics about stitching, beginning with a discussion about hooks and yarn and how to make simple chains, then gradually introduces skills and techniques until kids are crocheting confidently. With over 200 photos and clear, concise instructions in language easily understood by grade-school kids, you're going to be creating crafty crochet projects with your child in no time! Each project lists the crocheting skills that will be exercised in making it and projects are rated for difficulty, so kids can learn and grow as they develop dexterity and coordination. Your children will learn to crochet by making simple projects and building skills by practicing the essentials, and this book provides a sound foundation for a lifetime of crocheting enjoyment. And speaking of being crafty, this awesome book is packed full of things you can make, and even use for Christmas this year! I love that the book is filled with crafts we can actually use to decorate and to give fun things to others that we've spent the time to assemble. Christmas Paper Play is packed with fun and festive things to make and do. From Christmas decorations, to mini-crackers, it’s all here. Every page can be used as the basis of an activity, craft, or game, and all you need is a pair of scissors, some colored pencils, and the occasional dab of glue. Illustrated with artist and paper engineer Lydia Crook’s delightful artwork, Christmas Paper Play is a perfect present to keep kids entertained over winter break.